July 28, 2017 – Saturn’s largest moon, Titan, is one of our solar system’s most intriguing and Earth-like bodies. It is nearly as large as Mars and has a hazy atmosphere made up mostly of nitrogen with a smattering of organic, carbon-based molecules, including methane (CH4) and ethane (C2H6). Planetary scientists theorize that this chemical make-up is similar to Earth’s primordial atmosphere. The conditions on Titan, however, are not conducive to the formation of life as we know it; it’s simply too cold. At ten times the distance from the Earth to the sun, Titan is so cold that liquid methane rains onto its solid icy surface, forming rivers, lakes, and seas. These pools of hydrocarbons, however, create a unique environment that may help molecules of vinyl cyanide (C2H3CN) link together to form membranes, features resembling the lipid-based cell membranes of living organisms on Earth. Astronomers using archival data from the Atacama Large Millimeter/submillimeter Array (ALMA), which was collected over a series of observations from February to May 2014, have found compelling evidence that molecules of vinyl cyanide are indeed present on Titan and in significant quantities. “The presence of vinyl cyanide in an environment with liquid methane suggests the intriguing possibility of chemical processes that are analogous to those important for life on Earth,” said Maureen Palmer, a researcher at NASA’s Goddard Space Flight Center in Greenbelt, Maryland, and lead author on a paper published in Science Advances. 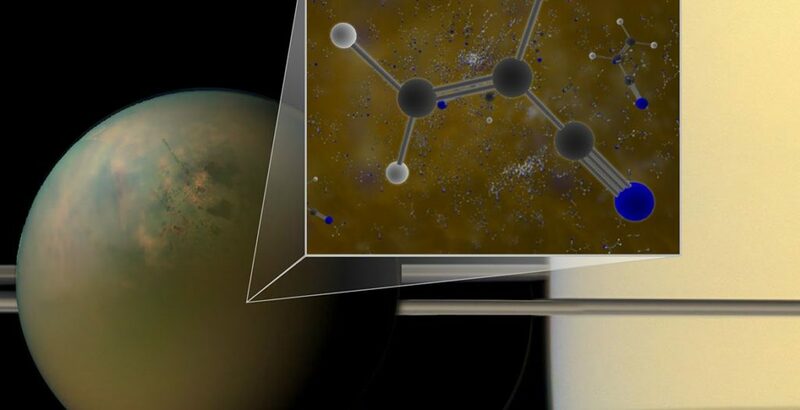 Previous studies by NASA’s Cassini spacecraft, as well as laboratory simulations of Titan’s atmosphere, inferred the likely presence of vinyl cyanide on Titan, but it took ALMA to make a definitive detection. By reviewing the archival data, Palmer and her colleagues found three distinct signals – spikes in the millimeter-wavelength spectrum – that correspond to vinyl cyanide. These telltale signatures originated at least 200 kilometers above the surface of Titan. Titan’s atmosphere is a veritable chemical factory, harnessing the light of the sun and the energy from fast-moving particles that orbit around Saturn to convert simple organic molecules into larger, more complex chemicals. “As our knowledge of Titan’s chemistry grows, it becomes increasingly apparent that complex molecules arise naturally in environments similar to those found on the early Earth, but there are important differences,” said Martin Cordiner, also with NASA’s Goddard Space Flight Center and a co-author on the paper. For example, Titan is much colder than Earth at any period in its history. Titan averages about 95 kelvins (-290 degrees Fahrenheit), so water at its surface remains frozen. Geologic evidence also suggests that the early Earth had high concentrations of carbon dioxide (CO2); Titan does not. Earth’s rocky surface was also frenetically active, with extensive volcanism and routine asteroid impacts, which would have affected the evolution of our atmosphere. In comparison, Titan’s icy crust appears quite docile.